The latest presidential elections were held in Russia on March 18, 2018. Vladimir Putin won reelection for his second consecutive (fourth overall) term in office with 77% of the vote. This result of the elections was a surprise to nobody. Lev Gudkov, the head of the authoritative sociological institute Levada Center, in an interview with the newspaper Süddeutsche Zeitung expressed the opinion that Russia has returned to totalitarianism, all democratic ideas are discredited in the country, and the March 18 presidential elections were just a ritual to confirm the powers of the incumbent head of state Vladimir Putin. According to Gudkov, the high level of Putin’s support, as in other authoritarian regimes, reflects the weakness of state institutions. The police and judiciary protect the state, and not the rights of individual citizens. Hence the hope for the leader. Democratic elections are not a part of Russian historical tradition. Until 1991 there was never an election of a head of state in Russia. The first President of the Soviet Union, Mikhail Gorbachev, was not elected by general election. In June 1988, at the Conference of the Communist Party (CPSU) of Soviet Union, Gorbachev, then General Secretary, launched radical reforms meant to reduce party control of the government apparatus. He proposed a new executive in the form of a presidential system, as well as a new legislative element, to be called the Congress of People’s Deputies. Elections to the Congress of People’s Deputies were held throughout the Soviet Union in March and April 1989. This was the first free election in the Soviet Union since 1917. On March 15, 1990, Gorbachev was elected as the first President of the Soviet Union with 59% of the Deputies’ votes. He was the sole candidate on the ballot. The first election of the President of Russia was held on June 12, 1991. It was held in accordance with the results of the all-Russian referendum on the introduction of the post of President of the Russian Soviet Federative Socialist Republic (RSFSR), that took place on March 17, 1991 (simultaneously with the all-Union referendum on the preservation of the USSR). The turnout for the elections of 1991 was 74.7%. On June 12, 1991 Boris Yeltsin was elected by popular vote to the newly created post of President of the RSFSR. Upon the resignation of Mikhail Gorbachev and the dissolution of the Soviet Union on December 25, 1991, the RSFSR became the sovereign state of the Russian Federation, and Yeltsin remained in office as president. Yeltsin was reelected in the 1996 election, about which critics widely claimed pervasive corruption. Most of commentators would agree that the elections of 1991 were the only really democratic elections of the head of state in the entire Russian history. In the Soviet Union, there was only one real power – Communist Party. The formal legislative branch, the Supreme Soviet, was approving all decisions of the Communist Party in 100% of cases. First elections to the Supreme Soviet were held in the Soviet Union on December 12, 1937. It was held according the 1936 Soviet Constitution, which had formed the Supreme Soviet. According to Wikipedia, “The elections were originally announced as being multi-candidate; however, by halfway through the year the announcement was reversed due to the distrust of the leadership during the Great Purge. (…) Many of the early individuals attempting to run as alternate candidates were arrested after the decision for multiple candidates was reversed. Additionally, the NKVD conducted mass arrests shortly before the elections. 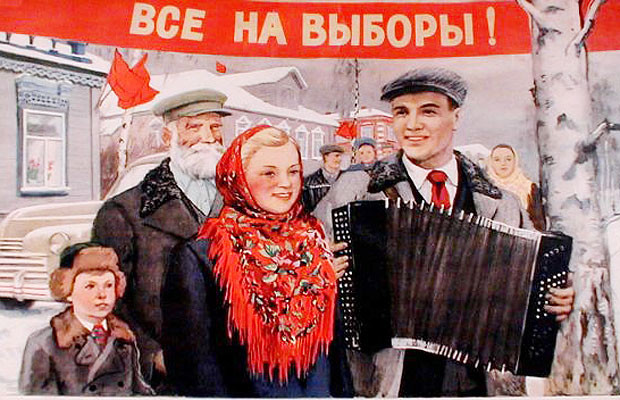 I do remember as a National Holiday the Elections in the Soviet Union of my youth. Everyone went to the polls very early in the morning, starting from six o’clock. Loudspeakers in the streets, in offices, factories, homes were transmitting patriotic songs. Everyone dressed for celebration, surrounded by children, waving little flags, went to the polling station, stood there in line to vote under the loud music of a brass band. After that the voters would go to the station’s snack bar, where on this day, after standing in another line, one could get some delicacies, unavailable in the regular grocery stores, and then went home to celebrate with vodka. And the results! Turnout was 99.98%. 99.84% voted for “the candidates of the people’s bloc of communists and non-partisans” (figures from the elections to the Supreme Soviet of the USSR, March 14, 1954). Only one sole candidate was presented for every position. There was no choice at all! By voting people just were approving the choice already made for them by the government. I remember that I, being a teenager, was surprised that nobody around me was bothered by the fact that they were choosing without real choice. That they were voting for the candidates already chosen for them by someone else. But people were just happy to have an additional holiday. Neither they, nor their parents and grandparents, had any human rights, including the right to choose their rulers. People usually do not suffer of lack of something that they never experienced in their life. So I’m not very surprised that Russia today seems to have returned to the tradition of past generations.